No Wagering Casino bonuses arguably are arguably the best casino offers in the industry as they come with no wagering requirements. You can keep what you win, with no rollovers and no conditions. 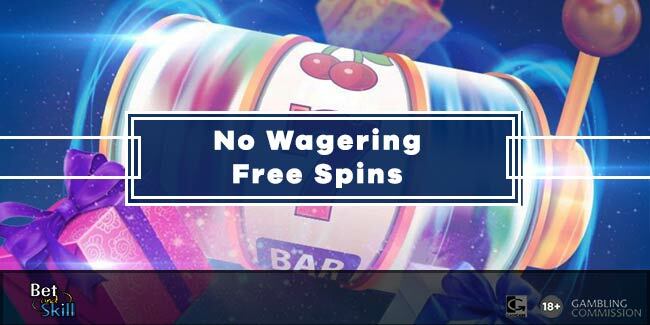 This page contains the best Wager Free Spins and No Wagering Casino Bonuses you can get at the moment! Wager Free Spins, also referred as Fair Spins, basically are Free Spins with no wagering requirements. The maximum win is not capped (like in the "old" free spins offers) and all winnings are paid as withdrawable cash! A wagering requirement is a multiplier, which is why you will see it shown as 5x or x20, which stand for five times or twenty times, respectively. This requirement must be met before a withdrawal of funds is possible. Eg: If you get £100 bonus and the wagering requirement is x15, you must wager a total amount of £1500 before to withdraw your winnings. Note: You can meet wagering requirements with winnings gained when using bonus funds. Of course, you can withdraw funds before the wagering requirements are met but you will forfeit your bonus. No wager casinos are expected to become very popular among online casino players. Find below a complete list of online casinos offering no wagering welcome offers to new customers. 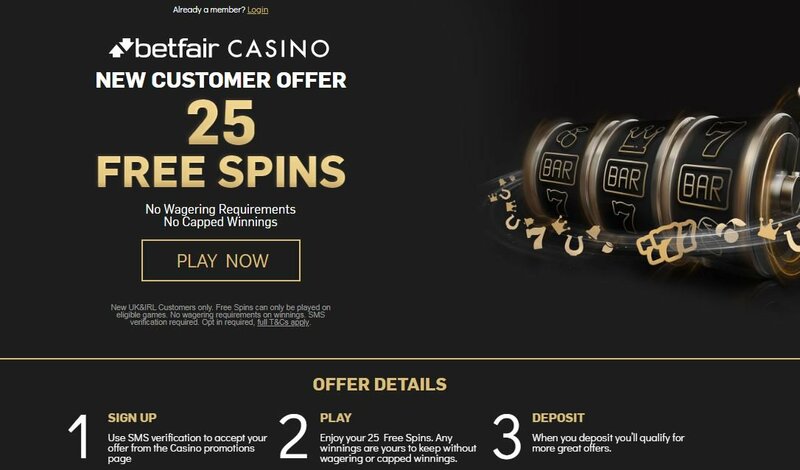 Betfair Casino has launched a new unmissable offer for new customers! You can claim 25 No Deposit Free Spins, with no wagering requirements and no capped winnings. This means that any winnings are yours! 30 No Deposit Free Spins to play Must Drop Jackpot Slots. There's no bonus code to use in order to get 30 no deposit free spins (as seen on TV)! On top of this, William Hill Vegas offers a tasty bonus on your first deposit, in order to suit towards your bankroll. Buy in £10 and play with £40! Open a new account with BGO Casino in few simple steps! Verify your mobile number and get 10 Free Spins. No Deposit Required! No Wagering Requirements! No Max Win! You can use your spins to play some of the most popular games: Starburst, Finn And The Swirly Spin, The Legend of Shangri-La: Cluster Pays, Aloha! Cluster Pays! Sign up to Betfred Casino via this page and receive 50 free spins with no wagering requirements when you deposit £10! All winnings are paid as CASH and are fully withdrawable! Register now at Power Spins Casino. Make your first deposit of £10 or more, and get 1 fair spin for every £1 deposited, up to 50 free spins! You can use your spins to play some of your favourite games: Robocop, Wild Beats, Jungle Trouble and Tiki Paradise. Open a new account with PlayOJO Casino! Each time you spend £1 you’ll get 1 free spins, up to 50 free spins with NO WAGERING REQUIREMENTS! 100 prizes every day! Win prizes by collecting bonus rounds. Level up and win! "No Wagering Free Spins and Casino Bonuses"